Everything you need to know about your new boyfriend and the best cameo in Charli XCX's 'Boys' video. 1. Who is Jay Park? 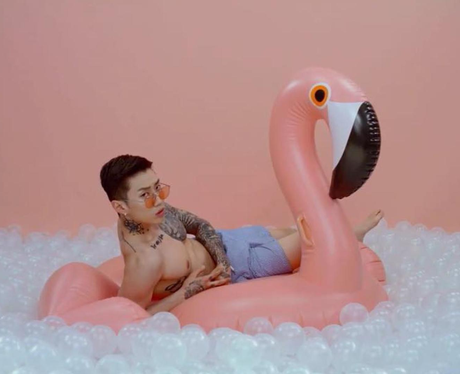 Your new boyfriend is not just a pretty face with a hot body covered in tattoos lounging on an inflatable flamingo in Charli XCX's new music video, ya know. Jay Park is an incredibly successful musician, actor, entrepreneur, producer and charitable bae. Basically, Jay Park is the most perfect human on the planet and if you don't know who he is, here's everything you need to know. 2. What is Jay Park's real name? 3. Where is Jay Park from? 4. How old is Jay Park? 5. What is Jay Park's Instagram username? 6. What is Jay Park's Snapchat username? You can find Jay on snapchat under the username: aomgjaypark. 7. How big is Jay Park's music career? 8. What is Jay Park's record label called? 9. What charities has Jay Park partnered with? 10. What happened to Jay Park when he was in 2PM? 11. How many tattoos does Jay Park have? 12. How tall is Jay Park? 13. Was Jay Park on SNL Korea? In 2013, Park joined the cast of Saturday Night Live Korea where he performed for 3 seasons. Needless to say, after he joined the case as a series regular, the ratings shot through the roof. 14. What was Jay Park's dance group called? Jay also used to be a competitive b-boy dancer, which is where his love and appreciation for the hip-hop culture began. He joined the Art of Movement dance crew in 2003 before moving to South Korea to kick start his career in music. 15. What is Jay Park's net worth?